As Cabot Station celebrates its centennial, we look back at 100 years of hydroelectric power along the canals of the Connecticut. Planter politics and process questions persist in Montague. Wendell and neighboring communities gather to consider new approaches to the last-mile broadband question, and the town also prepares for a significant road closure this summer. Erving’s selectboard hears requests for changes to town employee positions, including the treasurer and library assistant. GMRSD sets its final budget and looks at declining district enrollment, while Part V of Eye on Town Finances discusses school funding. 3D printers bring a new dimension to learning at Franklin Tech. 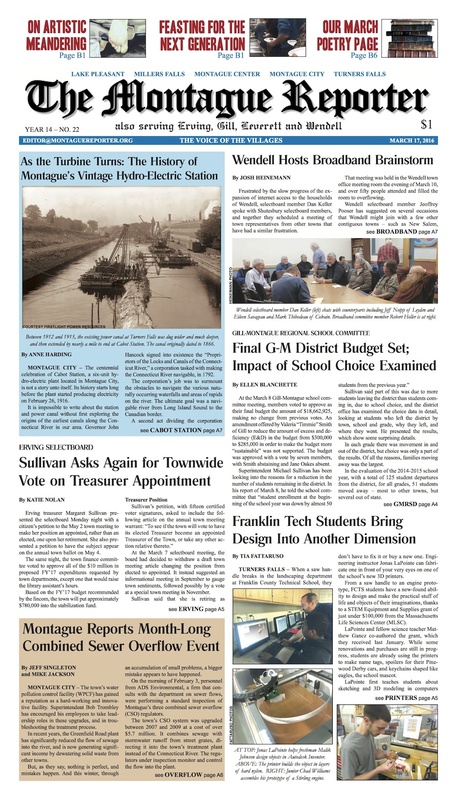 Montague’s Water Pollution Control Facility brainstorms solutions after a combined sewer overflow event this winter. Local hoopsters head to the Hampshire-Franklin All-Star Game. Our editorial juxtaposes record-breaking global temperature increases with global oil overproduction. And, our letter writers offer up another take on the management of the Montague Plains, an invitation to an anti-pipeline meeting in Erving, and thanks from a local resident for her surprise 85th birthday party. 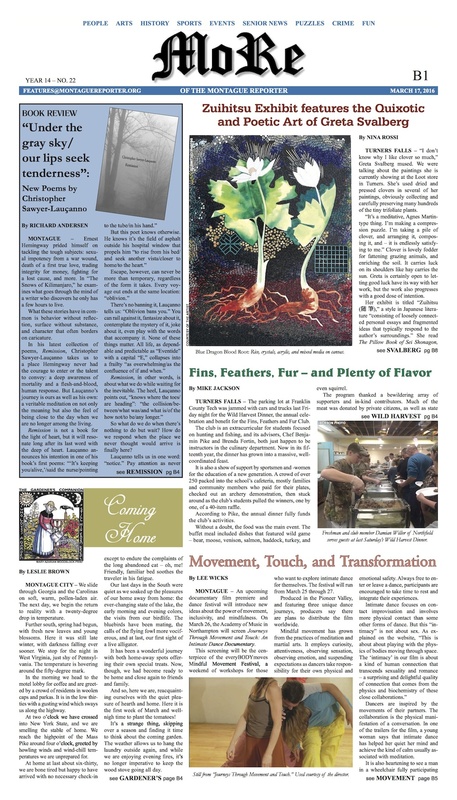 MoRe: Local poet and former Montague Reporter editor Christopher Sawyer-Lauçanno’s latest volume of poems, Remission, chronicles recovery from a life-threatening illness. An exhibit in Turners Falls showcases the work of a local artist whose pieces incorporate clover, quinoa, pills, and porcupine quills, among other materials. Franklin Tech’s Fins, Feathers, and Fur Club serves up bear golumbki, country-fried moose steak, and squirrel stew at its annual Wild Harvest Dinner. A documentary film premiere and dance festival draw practitioners of mindful movement to Northampton. The Gardener’s Companion wends her way home from Florida. The Healthy Geezer muses on hydration. The Pet of the Week is a good cat with a kind soul. Plus: the Poetry Page; Weird Healing; the Montague Police Log; arts and events listings and reviews, and so much more. Muster at your favorite newsstand and secure a copy of our Evacuation Day issue today!